When you spend a lot of time at the controls of word processors, spreadsheets, design software and 3D CAD, you may find that the pedestrian swill keyboards and mouse devices from the office supply and consumer electronics stores inadequate. I know I do. I used to go through a keyboard every year, and suffered from mouse fidelity issues (lack thereof). What I have found a superior approach is to using gaming interfaces. Gamers beat and pound away at their equipment, and subject them to real uses and abuses that office equipment is just not the equal of. Gamers also demand far more precision and consistent response. All good things for design uses. I beat the daylights out of keyboards. When you work with tools, you get used to exerting a certain amount of force in tool use. That means hitting keys a little harder than what soft handed office workers might exert. Meanwhile, I type a lot on any given day, frequently in excess of 4000 words. The wimpy blister switches under the keys of most keyboards are just not up to the task. They also have very little resistance to intrusion of dirt and grit that follows me in from the shop. I also want to feel and hear the keyboard work, and not feel like some chintzy plastic thing creaking and clanking, as I put it through its paces. I’m an old school tactical feedback junkie. So, after some time and several scrapped keyboards, I found Corsair Keyboards to be the top choice. 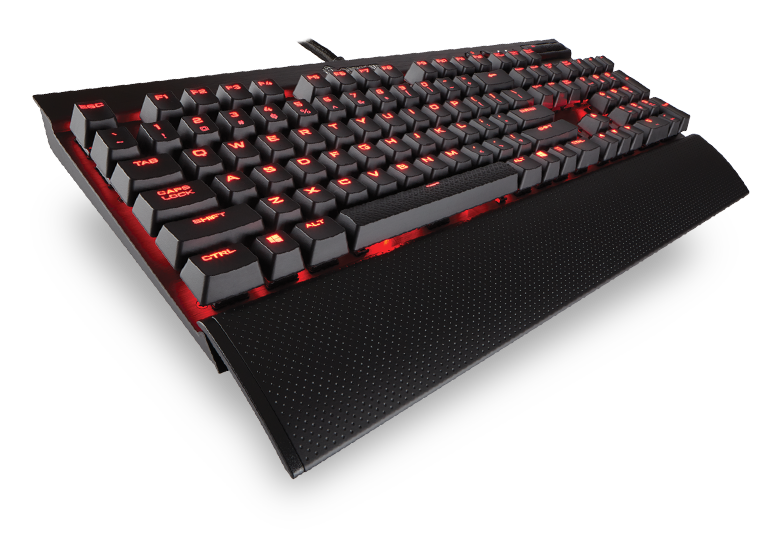 Corsair makes keyboards for the whacked out gamers, who abuse their keys as much as I do. These are mechanical keyboards, which means they use actual individual switched under each key. These can be replaced if necessary, including swapping heavily used keys for others elsewhere on the board. You can get these in many different configurations. Options include different key stroke actuating distances, LED colors, key colors, etc.. The keyboard also includes a brushed, black anodized fascia, and the foundation is solid as a rock. The underpinnings of all the Corsair keyboards are generally the same, with a selection of key stroke lengths, and LED colors under lighting them. For my use, I don’t need a lot of the features they offer, so chose the K70Lux. As an FYI, I don’t use wireless keyboards. The slight delay they impose, and the hassle of dead batteries is worse than dealing with a wire. Also, this is connected to an old school large format desktop machine, not a laptop. Lap tops have come a long way in power and processing speed, but are still not up to the same level as a good old box with standard size processors and memory cards cooled by fans. A keyboard you can pound on. Perfect for responding to even the most aggravating internet troll! The issue with mouse operation comes in three forms for me. The first is the fit in my hand. I need something that has a solid tactile feel to it that can be felt through bandages, burns, and callused finger tips. The second is tracking consistency, particularly when using Illustrator or Solid Works, where the ability to hone in on one line or edge without having to play around with zooming in and out, is a real time saver. The problem is, office grade commodity mice have the resolution of less than the screen at 800dpi. The third is response time. Wireless mice are really neat-o toys, but for real CAD work, a wired mouse is still king. No delay time, no dead batteries in the middle of a project, and no changes in sensitivity to the tracking surface as the batteries fade. Being happy with the Corsair keyboard, I dipped into the gamer well once more. Corsair mice are tough little critters. 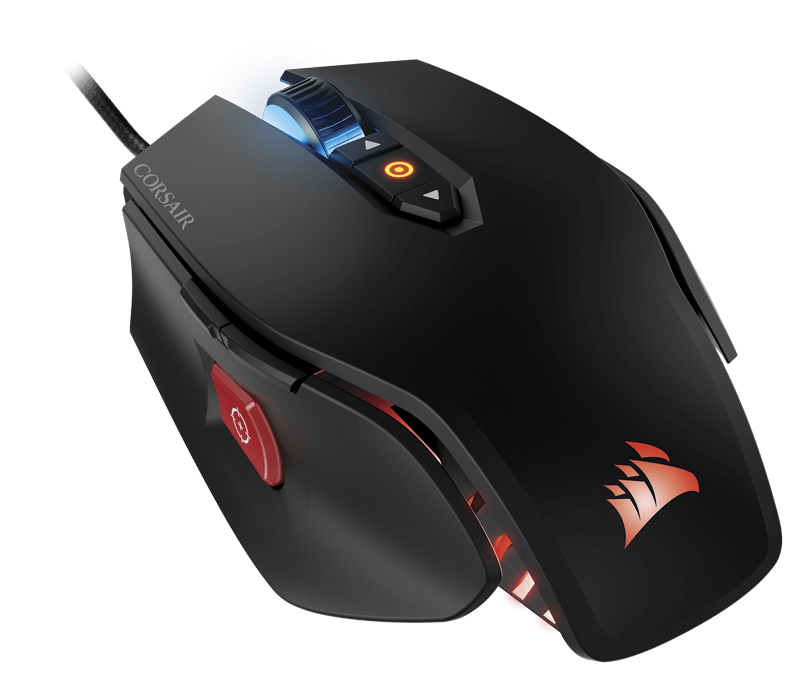 The Corsair M65, my personal choice, has an aluminum frame. There is also a weight system in the base that can be adjusted to change the way the device feels as it is moved around. It takes a little tinkering, but the result is worth it. An interesting bonus with the M65, is that you can get replacement Teflon glide pads for the base should they wear, rather than chucking the device into the trash. The M65 resolution can be set as high as 12000dpi, so the issue of resolution is solved. There is also a “sniper” button on the thumb side of the device that changes the mouse response for this instances when you are trying to zero in on a tiny detail, or select a letter in a block of text, etc… The mouse is wired, so response time is instantaneous. Finally, the weight and the design of the device provides very strong tactile feel. I also use a metal plate mouse pad, like those made by Alsop, as they wear well, and are easy to clean. Who cares about building a better mousetrap, the hunt of a better mouse is far more important to me. The performance of these interfaces eclipses all the junk I’ve dumpstered over the years from the office supply stores. The fact that these components actually carry a minimal premium was a bonus. While there are certainly $20 keyboards on millions of desks of unfortunate cubical drones, accompanied by $10 mice, I don’t consider those a legitimate baseline of comparison. CAD work demands more than what commodity mice provide. Regular writing work has been a matter of tactile interface that has caused writers to seek tools that fit them like an extension of their hands. From hand-made pens to typewriters, writers are a picky lot, and for good reason. If you feel good about the mechanical bits, the writing holds center stage, with less feeling of effort. With that in mind, the cost of the pair of keyboard and mouse I use costs less than $170, tax included. Considering there are currently “ergonomic” mice on the market that cost more than the M65, and the number of $59 premium keyboards I have tossed, the return on this minimal investment is solid. The ability to repair the keyboard (although it does require some soldering skills) is a bonus, over just making more garbage to be dealt with in the waste stream. So, while the only thing SSL about this product is the LED back-lighting used in the devices, I thought I’d share just the same. Cheers! This post couldn’t have better timed as my umpteenth Logitech keyboard failed last week. Ordered the Corsair keyboard and mouse you recommended – best workstation upgrade I’ve made since the standing desk. Love the mechanical feel to the keys and the mouse is SO much better to use with CAD (gonna find a use for the sniper button in time). Thanks! Try the sniper button when in cad using the left button to land an end point, move an object, etc… It reduces the response, doubling the resolution, allowing more finite selection. Also works in pan and zoom, as well as 3D rotation functions. At lest that’s how I’ve been using it most regularly.